Reading: Library on Sunday. Finish reading your library book. Click here to see pictures of our sports day yesterday. Math:﻿ Prepare for Math assessment tomorrow. Use the revision pack included in this week's homework. Grade 1 sports day Tuesday Jan 27th. Tomorrow will be vaccination day, if you feel that your child may have a reaction you may take them home early. *Girls swimming tomorrow, please remember to send them with the appropriate swim cap. * Spelling test and math quiz tomorrow morning. Don't forget that tomorrow is boys swimming. *Our new is "Sharing the planet" about how humans impact the ocean habitat. Don't forget that tomorrow is girls swimming. 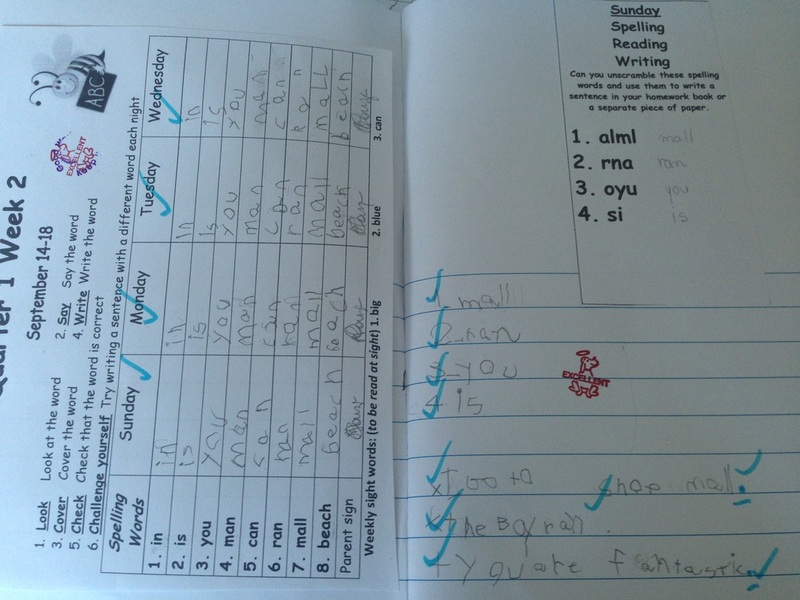 * Test on spelling words tomorrow: at be have dig big biggest community student. *Math: the American coins: penny (1 cent) and nickle (5 cents), telling time to the hour, and addition up to 10. *Our new unit starting this week is "Sharing the planet" about how humans impact the ocean habitat. Any research that you can do at home and send in with your child would be great to help us in this fun new unit! Don't forget that tomorrow is Healthy Eating Day. Have your child bring in a healthy snack and wear the same color as the snack they bring in (vegetables or fruit). *Please practice spelling words: at be have dig big biggest community student. *Our new unit starting this week is "Sharing the planet" about how humans impact the ocean habitat. The homework for next week is available now. Please remember to read daily with your child, practice the sight words and spelling. The pool is still under repair but you may send your child to school with their swimsuit just in case it gets fixed. Please send in any extra photos that you may have of your child doing activities in the communities they belong in to put on our "action wall". Thank you to those who have returned the signed Medical and Student handbook forms! Don't forget to continue practicing the daily sight and spelling words as well as Math homework to help your child grow academically. I hope that you can join us this Thursday for the "Hajj" in the school gymnasium. Our classes time will be in from 10-11, after this you may collect your child if you'd like. I have posted some more photos for this month on our " photo gallery" page. Please remember to practice the math skills, spelling words, sight words and letter sounds daily to help strengthen your child's literacy skills. Also, the Family Handbook was sent home today, please remember to sign the back page and return to the school. Please remember to review for our Unit 1 Math assessment that's on Wednesday September 24th. Also continue practicing our weekly spelling words and sight words as well as read at least 20 minutes daily. Don't forget that tomorrow is Tuesday and the students will be dismissed at 12:30. Please remember that tomorrow is PE and the girls will be swimming. Also have your child turn in their completed homework for this week. We will be having our spelling test tomorrow so make sure your child studies tonight and gets good rest. Please don't forget: Tomorrow is Library and to turn in the "Library book form" signed with your child's school ID number on it so that your child can take out a new book. The students are working very hard and adjusting well to their new routines. Please remember to have your child read and do their homework daily. Don't forget that tomorrow is our early out day and the students are to be picked up from the blue playground at 12:30.